Available for Special Order. Usually Arrives in our Store within in 1-5 Business Days. 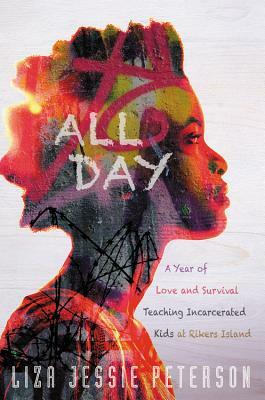 ALL DAY is a behind-the-bars, personal glimpse into the issue of mass incarceration via an unpredictable, insightful and ultimately hopeful reflection on teaching teens while they await sentencing. Told with equal parts raw honesty and unbridled compassion, ALL DAY recounts a year in Liza Jessie Peterson's classroom at Island Academy, the high school for inmates detained at New York City's Rikers Island. A poet and actress who had done occasional workshops at the correctional facility, Peterson was ill-prepared for a full-time stint teaching in the GED program for the incarcerated youths. For the first time faced with full days teaching the rambunctious, hyper, and fragile adolescent inmates, "Ms. P" comes to understand the essence of her predominantly Black and Latino students as she attempts not only to educate them, but to instill them with a sense of self-worth long stripped from their lives. "I have quite a spirited group of drama kings, court jesters, flyboy gangsters, tricksters, and wannabe pimps all in my charge, all up in my face, to educate," Peterson discovers. "Corralling this motley crew of bad-news bears to do any lesson is like running boot camp for hyperactive gremlins. I have to be consistent, alert, firm, witty, fearless, and demanding, and most important, I have to have strong command of the subject I'm teaching." Discipline is always a challenge, with the students spouting street-infused backtalk and often bouncing off the walls with pent-up testosterone. Peterson learns quickly that she must keep the upper hand-set the rules and enforce them with rigor, even when her sympathetic heart starts to waver. Despite their relentless bravura and antics-and in part because of it-Peterson becomes a fierce advocate for her students. She works to instill the young men, mostly black, with a sense of pride about their history and culture: from their African roots to Langston Hughes and Malcolm X. She encourages them to explore and express their true feelings by writing their own poems and essays. When the boys push her buttons (on an almost daily basis) she pushes back, demanding that they meet not only her expectations or the standards of the curriculum, but set expectations for themselves-something most of them have never before been asked to do. She witnesses some amazing successes as some of the boys come into their own under her tutelage. Peterson vividly captures the prison milieu and the exuberance of the kids who have been handed a raw deal by society and have become lost within the system. Her time in the classroom teaches her something, too-that these boys want to be rescued. They want normalcy and love and opportunity. LIZA JESSIE PETERSON has worked with incarcerated youth-both male and female-in various capacities for twenty years as a teaching artist, poet-in-residence, NYC Board of Education full-time GED teacher, re-entry specialist, outreach coordinator, and most recently as a program counselor with the NYC Department of Corrections. She appeared on two seasons of HBO's groundbreaking Def Poetry and was featured in Ava Duvernay's critically acclaimed film The 13th. Her one-woman stage play, The Peculiar Patriot, toured in more than thirty-five penitentiaries across the country and the full production premiered in New York at the National Black Theater in 2017 and received an Agnes Gund Art for Justice Fund grant. Liza is a writer, actress, speaker who lives in Brooklyn. "Liza Jessie Peterson's ALL DAY is a must read for anyone who has ever cared about young people - and all people. Peterson brings amazing warmth, love and laughter to the devastating state of our juvenile justice system. In her able and gifted hands, we meet young people we will not soon forget. So glad this book is in the world." This remarkable work of witness, testimony and empathy by Liza Jessie Peterson is a literary gift which could not be more precipitous. We seem to be reminded near weekly now of how disposable and hated young black men are by powerful sectors of this society. Peterson challenges us to see and feel beyond dangerous tabloid stereotypes. This feat she accomplishes with exquisitely flowing, pungent prose. All Day is a generous bouquet of hip, laconic storytelling informed by big-sisterly-love and a compulsion for social justice. Liza Jesse Peterson speaks the recipe of all of our freedom into existence. And magnificently so! Liza Jessie Peterson has captured the essence, the humor, the intellect and the psychology of the lives of young people (especially young Black men) trying to survive in the penal systems of America. I was captivated by the characters. I could see them, smell their musk, feel their attitudes and hear their voices to a point where I felt I knew them and would recognize any one of them if I bumped into them on the street. The stories, the characters, the talent, conflicts and the love are all there with a message: There must be a better way to raise our youth who have gone astray than to warehouse them in penal institutions. All Day is a must-read for anyone who cares about children and believes in the possibilities that arise from affording them the opportunity to have the brightest of futures. In a very real voice Liza Jessie Peterson recounts her days teaching young men imprisoned on Rikers Island awaiting trial. She switches between her street wise motherly voice to the voices and inner thoughts of young men struggling to maintain identity, dignity, credibility and sanity. Her interactions with them and them with each other are both heart wrenching and chilling at the same time. She peels back layer upon layer of these kid's reality and exposes the humanity and vulnerability of young men who are scared, beautiful and dangerous. As an educator and quite often a mother fiqure she steps inside their comfort zone and often brings out the very best these kids have to offer. The book is in many ways a teacher's quide of how to gain the trust and respect of kids who often see themselves as societies throwaways. Liza educates with a stern and loving hand and often brings about a meaningful change in these kids but also finds insights into herself about how to truly make a difference in the lives of children lost in the matrix. "ALL DAY is a gem, a honest look at our all too often forgotten youth. Liza Jessie Peterson takes us on this journey in a way that only she can, holding up a mirror and forcing us see what we are allowing our fellow citizens to go through. Her journey is as remarkable as the way in which this book was crafted. It's truly a must read."